The Royal College’s building is admired and recognized as an architectural landmark. Located at 774 Echo Drive in Ottawa, Ont., the brick building was formerly the monastery of the Sisters Adorers of the Precious Blood. It was originally constructed in 1921, and the tall arches, striking stained glass and other key design features reflect this long history. Founded in Saint-Hyacinthe, Que., in 1881, members of the Sisters Adorers of the Precious Blood were required to pray for six hours or more daily. As a cloistered order, nuns were only allowed to leave the enclosure for genuine spiritual and physical needs. Public mass was also regularly celebrated in the public chapel, though the sisters attended a private service. Approximately 60 nuns lived in this building at its peak. When the convent was sold, the 11 remaining Sisters were moved to a convent near Quebec City. The building is a classically inspired structure, five stories in height. It is organized around a central axis with wings to house its various functions. The exterior is a pale yellow brick with simple architectural details such as alternating square- and round-headed windows and a centrally placed belfry. The original building was designed by Canadian architect Alphonse Contant. The Royal College purchased the property in 1991, conducting extensive renovations to the interior of the building before moving in the following year. Modifications were led the architectural firm, Murray & Murray Associates Inc. Although the building has been subject to extensive modifications, the exterior architectural integrity has been preserved. 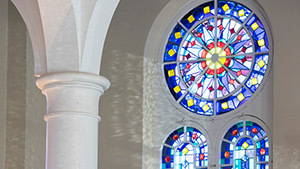 In 1993, the City of Ottawa recognized the Royal College’s efforts to retain and reuse the building while paying particular attention to detailing such as the windows and stain glass, awarding our organization and development team the city’s Certificate of Merit. 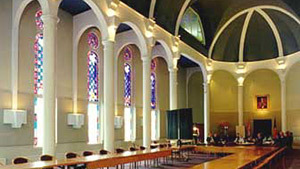 Inside, the main chapel was turned into the Royal College’s Council Room and the Sisters’ private chapel was refurbished as the Roddick Room, members’ reading lounge and meeting space. Both rooms are architectural points of interests, complete with stained glass windows and vaulted ceilings. The central courtyard now serves as a glassed atrium.